SharpCap has a scripting language built in that allows simple programs to be written that can perform just about any action that can be performed when controlling SharpCap with the keyboard and mouse. The scripting language is based on a language called IronPython which is a Microsoft port of the Python Programming Language to the .NET framework. The Scripting console can be shown by selecting Show Console from the scripting menu. The scripting console is an Integrated Development Environment (IDE). This allows for the creation, execution and debugging of code using the IronPython programming language and its integration into SharpCap. Some examples are displayed. One of these is code to list the cameras available to SharpCap. Lines beginning with # are comment lines, meaning they are ignored by the computer. 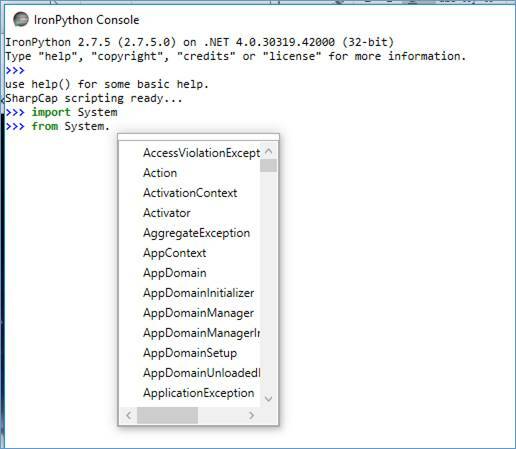 Code can be typed directly into the console or pasted into the IronPython Pad in the lower part of the console window. If code is typed into the upper part of the window, it will be run when the <Enter> key is pressed. Longer sections of code should be typed into the lower editor area where they are not run until the ‘Run’ button is pressed. In the IronPython Pad, type in the code print SharpCap.Cameras and press the Run button. The following output appears in the IronPython Console. 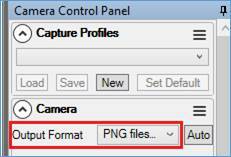 Click the floppy disk icon and save the file as cameras.py for use in the Run Script menu item below. The editor automatically shows the possible methods and properties for an object upon typing the '.' – this helps explore the available API. As soon as the ‘.’ is typed, a list appears allowing selection. This trick can be applied to many parts of the SharpCap API to allow discovery of the methods available and what parameters they require. The Run Script menu item opens a File Explorer window to allow selection of a previously created Python script. 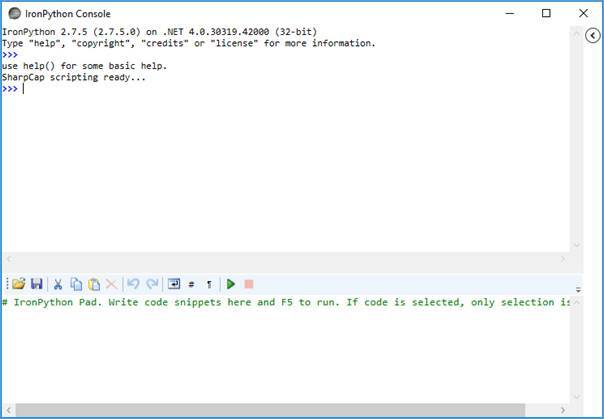 Scripts (programs) can also be created from within Windows using any text editor. The scripts must be saved with a .py extension. From the Menu select Scripting > Run Script. Browse to the file something.py and click the Open button. The script should execute. 1. From the Menu select Scripting > Show Console. 2. Drag the Iron Python Console to one side using the mouse. 3. From the Menu select Scripting > Run Script. 4. 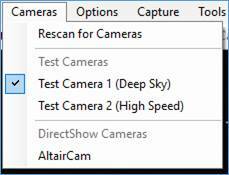 Navigate to the file cameras.py, created in the previous section, and select it. 5. The script executes and the result (the available cameras) is shown in the IronPython Console. The above example has no practical use but serves to demonstrate how to use SharpCap functionality. · Create a simple script using the IronPython Console. · Run the script from within the console. · Run the saved script directly from the Run Script menu option. Upon selecting Show Console, an Integrated Development Environment (IDE) is displayed. This allows for the creation, execution and debugging of code using the IronPython programming language. The code below will capture a single PNG image and save it to a file. The destination d:\capture.png will need to be changed to somewhere convenient on the computer being used. 1. Start SharpCap and from the Menu select Cameras > Test Camera 1 (Deep Sky). 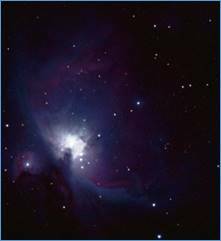 The M42 image should be shown in the Capture Display Area. 3. From the Menu select Scripting > Show Console. The IronPython Console will open. and paste it with Ctrl+V (or type directly) into the IronPython Pad (bottom part of the IronPython Console). Edit the destination (underlined in red) to be something appropriate on the PC in use. 5. Press the Run icon (or F5). 6. Check the destination which, all being well, should now contain 2 new files called capture.png and capture.png.CameraSettings.txt. 7. Edit the code to change the capture file name to be capture2.png. 8. Click on the floppy disk icon and a file explorer window opens. Save the file as capture2.py (the .py extension is important). 9. Close the IronPython Console. SharpCap.SelectedCamera.Controls.OutputFormat.Value = "PNG Files (*.png)"
The main application object, all other objects are accessed via this object. The controls available on the currently open camera. Many common controls can be access directly, but others will need a check of each item in the array to find the control needed. A collection of (ASCOM) focusers detected by SharpCap. SharpCap.Focusers.SelectedFocuser can be used to connect to a specific focuser and then access it via the SelectedCamera.Controls collection. Collections of ASCOM mounts and filter wheels, work in the same way as Focusers. The main application window of SharpCap. Take care changing properties or calling methods on this as it may break things. In general, the most used objects will be SharpCap.SelectCamera and SharpCap.SelectCamera.Controls. Can the camera pause a video capture without stopping it? Begins a prepared video capture. The capture will run until any limit is reached or StopCapture() is called. The output file(s) will be named according to the selected naming scheme. Cancel a capture that has been prepared (instead of running it using RunCapture). Returns an object describing the status of the camera including frames captured, average frame rate, etc. The number of frames processed by the camera (including preview frames) since the last time preview was started or capture was started or stopped. Note that the available controls vary from camera to camera, and only ColourSpace, Exposure, Resolution and OutputFormat are always available. True if the control is actually available to read or write values. Integer controls may have a step value defined - they can only be changed in multiples of this value. This is very rarely encountered. The value of the control, which can be retrieved and (if not ReadOnly) changed. The type of value that the control has. Any other type of control. In the case of a MultipleChoice control, a list of the choices available. Examples of scripting tasks are shown below. The code below will capture a single PNG image approximately every 15 seconds and write a timestamp into the image itself before saving it. It would be simple to modify the code to save each timestamped image under a different filename or to remove the timestamping step. 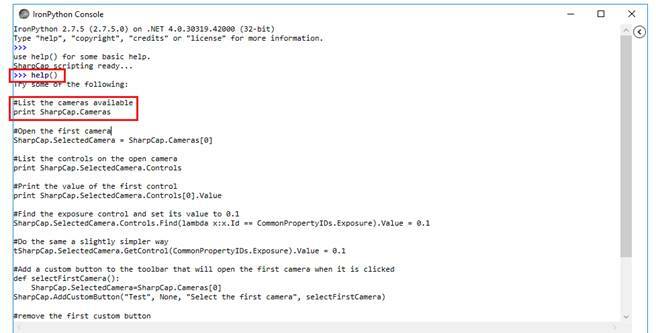 The code relies on a camera already being selected and previewing and that the camera can output to PNG files (i.e. will not work if the camera is in a 12/16-bit mode). From Scripting > Show Console, type the following code into the IronPython Console. Do not copy and paste as this negates the purpose of the exercise. At certain places, when ‘.’ is typed a dropdown will appear showing possible methods and properties. Select the appropriate text. The typed in code should look like this. When run, nothing will appear to happen except an additional >>> will appear in the console. No errors messages is a good sign. This enables use of the .NET type System.Drawing.Rectangle which is required to specify the selection area - the first 3 lines, which allow access to the .NET type, are the important ones here as they can be used for other .NET types too. Consider the following non-trivial task. Total capture time = 3h 20m but no intervention is needed if the capture is managed by a script.